A police officer who was hired after he was charged with violently attacking and stabbing his wife's ex-boyfriend, was the subject of 21 complaints for excessive violence and sexual assault. Atlantic City, NJ – While it is not uncommon for a police officer to commit a crime that he is never convicted for, one department is being accused of covering up at least 21 criminal complaints against an officer who they hired after he was convicted of violently stabbing a man. Officer Franco Sydnor, 41, has a record that includes allegations of sexual assault, domestic violence, physical assault and a host of other offenses that have accumulated over the years. Yet even though his colleagues were aware of his issues, the Atlantic City Police Department continued to come to his defense, and he was never actually charged for any of the allegations despite overwhelming evidence. The complaints against Sydnor are coming to light now, thanks to a lawsuit filed by Anthony Moore. He became one of Sydnor’s victims in 2012 when he was part of a group of intoxicated men who were forcibly removed from Bally’s Casino during his brother’s bachelor party. Sydnor insisted that he did not intentionally hit Moore and that the severe head injuries Moore received as a result of their encounter happened when Sydnor’s baton accidentally “grazed” Moore’s head. 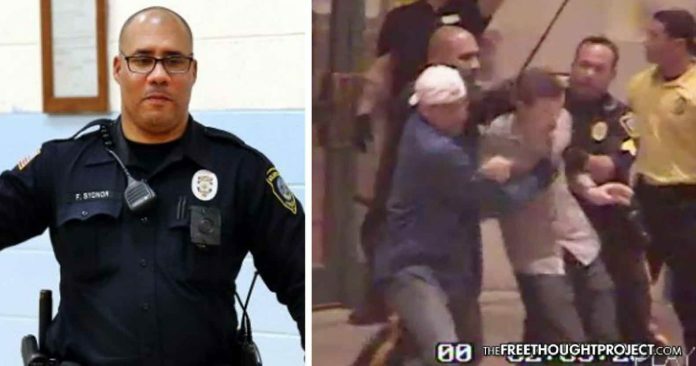 However, surveillance footage from the casino shows Sydnor forcing Moore onto the ground and then repeatedly striking the intoxicated man with his baton. Moore’s attorney, Jennifer Bonjean, told the Asbury Park Press that Moore is now filing an excessive force lawsuit against Sydnor and the Atlantic City Police Department, claiming that the department failed to provide adequate training and discipline for its officers, it botched the investigation into Moore’s assault, and it has covered up Sydnor’s conduct in the past. Sydnor’s attorneys have pushed for his record to be excluded from the trial, and there is a good reason why they don’t want it to be used against him. The officer’s pattern of violence appears to have started when he was 19 years old, a few years before he was hired as a police officer. Sydnor’s wife’s ex-boyfriend accused Sydnor of stabbing him four times in the chest, stomach and back with a knife in 1996. While Sydnor was charged with aggravated assault, he ended up taking a plea deal and pleading guilty to fourth-degree criminal possession of a weapon. In 2002, Sydnor was charged with making terroristic threats after he threatened to kill the husband of the girl he was having an affair with. He reportedly said he would kill the man “anytime” and he looked forward to the local newspaper reporting that the man’s body was found with his head cut off. Despite the fact that there were clear indications that Sydnor had violent and abusive tendencies, he was hired by the Atlantic City Police Department in 2003. Not only did his behavior continue, but the department became complicit in covering for him in an astonishing number of incidents. Sydnor lied about the incident and insisted that he went into the woman’s apartment because he had offered “counseling” for drug abuse. He also lied about the amount of force he used when assaulting Andrew Moore at the Bally Casino, and there are a number of other incidents where Sydnor has claimed to use very little force, and video footage has shown him using excessive force against non-threatening individuals. The abuse did not just apply to the people he was supposed to “serving and protecting” on the street. Sydnor has also been accused of sexual assault by a female officer who claimed that he groped her and then drove her to a strange location in an attempt to intimidate her. The woman said she was terrified of reporting the assault, and even when it was reported by a fellow employee, it was treated as nothing more than an administrative complaint. Judging by Franco Sydnor’s past, there is no doubt that he has a pattern of violent tendencies and there are a number of innocent victims who have been the subject of his wrath. However, the Atlantic City Police Department is also complicit in his crimes and by covering up his actions, the department is teaching both Sydnor and his fellow officers that it sees nothing wrong with illegal violence and assault committed by its officers, and it will continue to let Sydnor abuse other innocent citizens while he continues to earn a salary of more than $106,000 each year.